The Kenmore Summer Green Series was a series of interesting talks, demonstrations and discussions held Thursday evenings in the summer. One person attending the talks dubbed the Series “Kenmore’s Chautauqua” because of the quality of the conversations and the casual, yet verdant setting. The Series featured truly fascinating and notable people who came to the Village Green to talk about their topic, lead a discussion and answer questions about it. One notable evening found then County Supervisor, Chris Collins hearing a lot about Kenmore Avenue. The road that bears our community name had been in notoriously bad shape for some time. People gathered to listen to the Supervisor but also to pointedly let him know that the road needed his attention. Visual displays were used and it was well past dark by the time everyone had their say and left the talk. 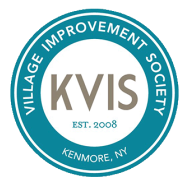 This discussion lead to many more on the topic with the KVIS Public Properties Committee -this then lead to our direct activism about the road including voicing our concerns at GBNRTC meetings, etc. The road since has had a 'lick and a promise' of a top coat of blacktop but it still lacks curbs and other aspects that make it safe and visually pleasing.